Does Stephanie have an assistant photographer? How many images do you take on an average 8 hour wedding day? Do you shoot the rehearsal dinner? What if YOU cancel on us? What do albums looks like? How long does it take for our albums to arrive? Do you Travel? How far do you travel? What are travel costs? If I'm out of town, can you still take my engagement photos? How long do engagement sessions take? Can we plan our session on a weekend? What if my wedding is out of town? Can you still take our engagement photos? What does it mean when you "edit" an image? We have three customized collections to choose from. We have coverage starting at 3,900 for 8 hours and complete collections beginning at 4,800. If you are having a morning wedding or require less time, a customized collection can be made for you. To see these in detail, please inquire here. Yes! My husband Stephen is my main second shooter. On the rare occasion Stephen is not present, I will have another shooter present with me on your wedding day. It typically takes 4-6 weeks for full editing completion. It's probably tempting to ask us how the progression is going but just know we are working hard to finish your images in a timely manner. Yes! Once we finish editing the images from the wedding day, we deliver a disc to you. You then OWN the rights to these images. I have a list of preferred printing locations but you are able to post these on facebook, twitter or wherever you choose. All the images will also be posted in an online proofing site where you can view them and order them if you'd like. No and we do not allow the extra photographs to be seen as they are typically duplicates with eyes closed. We break down all the images to the best 700-1,200 images. These are all edited in detail and delivered to you on a disc as well as an online gallery. Typically we do not shoot rehearsal dinners unless requested for an additional cost. YES! If you are working with a wedding planner, we will work with them closely to make sure we have enough photo time to ensure you will have a relaxed day with plenty of photographs. If you are not working with a planner, we will work together to create the best schedule. To see a detailed wedding day schedule, click here. YES! I cannot stress enough the importance of having a first look for your wedding day. This isn’t the ONLY option, but it definitely is the best option for your photo outcome. It allows you to have a more relaxing day, as well as have many more photographs. I wrote an entire post about this right here. Yes. Family portraits are just as important to us as they are to you! We request a full list of family groupings at least two weeks before the wedding day. This way, we don’t forget anyone and you walk away with all your family photos! If you decide to do a first look for your wedding, family portraits are usually done in nice natural light before the ceremony as well as a few extended family portraits after the ceremony. We require a 30 percent deposit of the total collection you choose to reserve your wedding date. We do not hold any date without a deposit and signed contract. We reserve dates on a first come first serve basis. If your wedding date is canceled, your retainer fee will be kept in full. Once your contract and retainer fee is received we turn down any other wedding on this date. The retainer fee guarantees that we hold your date exclusively for you therefore all other weddings will be turned down. We have never canceled on a client. If I die, or am unable to make it because of a family emergency or an act of God, we will find a competent professional to take our place. We charge $200.00 for any hour over what the contract is signed for. This is of course always discussed and confirmed with you before doing so. Stephanie Fay Photography has been up and running since 2006. We have shot well over 150 weddings. 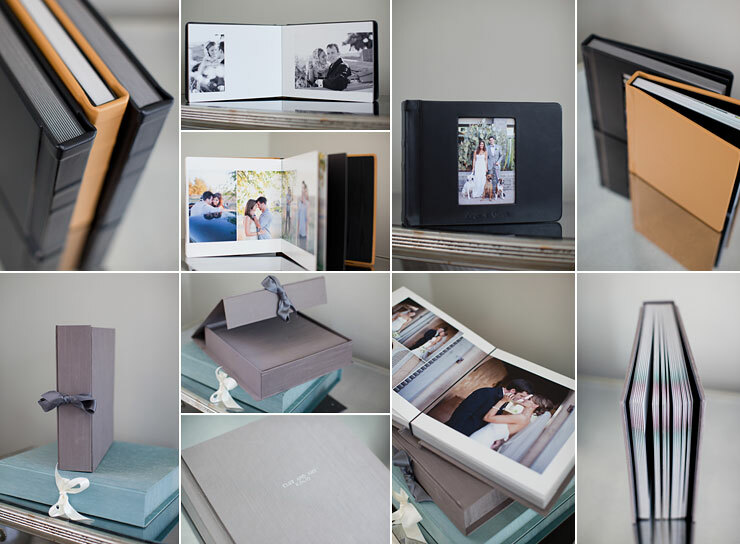 We offer two styles of albums. Leather and fabric. Both albums have the exact same configuration inside. The pages are thick, and extremely durable as the photos are printed into the pages. After the design process is complete, it takes around 6-8 weeks for your albums to be delivered. Yes! We LOVE traveling to weddings. We consider ourselves destination photographers and we always love hearing from out of towners. Because we love traveling, we are always willing to help look for the most affordable way to arrive at your destination. We are available to travel anywhere in the world. We have separate collections for in town weddings as well as out of town weddings. Please inquire to see these collections. Yes! We HIGHLY suggest we have the opportunity to work together before your wedding day. It’s crucial to get to know each other in front of the camera so your wedding day is a breeze. Consider it a precurser to the wedding day! AND you get to have fun doing it We typically shoot the engagement session two days before the wedding day if we are not able to arrange this anytime before. On most occasions we are able to shoot engagement sessions in town but on the rare occasions we shoot your engagement session on the same trip as your wedding, we just ask for an extra night hotel room to account for us arriving early for your engagement session. We ask each bride and groom to cruise through my blog and find the engagement sessions that seem to fit their taste. If you like romantic fields, we want to help you find that feel. If you like modern backdrops, we want to find that location that suits your taste the best. I am a VERY visual person and love exploring for new exciting spots to photograph. We try to stay away from shooting on private properties such as hotels as they do not like photographers shooting at their property but planning ahead is the best way to find out. We always work according to light so shooting outside is ideal click here to read about engagement locations. Engagement sessions usually take 1-2 hours depending upon where we are shooting. If we are shooting in Los Angeles, we typically plan a longer shoot according to traffic. Or, if you want to shoot two locations, we will need a bit more time to shoot. Because we work most weekends shooting weddings, the weekends we have off are mostly spent with family. We are occasionally available on a weekend, but we ask our bride and grooms to plan their work schedules in advance to shoot on a week day if possible. Typically our shoot start at an hour to two hours before sunset. We are located in the lovely city of Phoenix, Arizona but we consider ourselves destination wedding photographers. Of course!! For most of our destination weddings, we take the engagement photos two days prior to the wedding. This will help prepare you for the wedding day. In this case, we just ask for an extra hotel night which can be discussed while talking about travel arrangements for the wedding. Yes. Some images just look better black and white! You will get a variety of color and black and white images. Most definitely yes. I can provide this to your venue if they require it. Unfortunately, no matter what day we are photographing, it still is the same amount of work as it would be on a weekend. So, no we do not offer discounts. Other than a list of family groupings, we do not need a list of things to photograph. Our job is to photograph every detail we see at your wedding. Looking down at a list will only hinder us from seeing whats in front of us. Yes! if you reside and are getting married in Arizona, we are required by the state to charge sales tax. We like to keep our images "clean.'' This means we want all the images to look as close to real life as possible. We don't use heavy filters or heavy editing tools as our goal is to have your photos remain timeless.